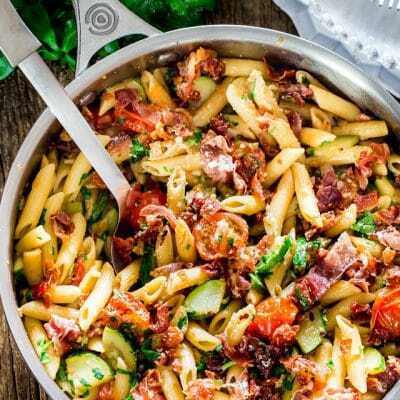 This Penne with Prosciutto, Tomatoes and Zucchini can be on your dinner table in 30 minutes. 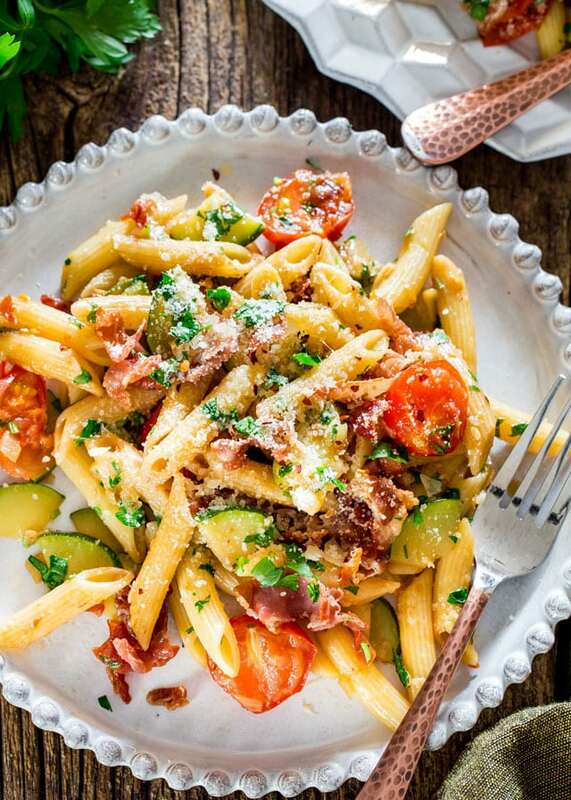 Crispy bits of prosciutto, zucchini and blistered cherry tomatoes is what makes this penne incredibly delicious. 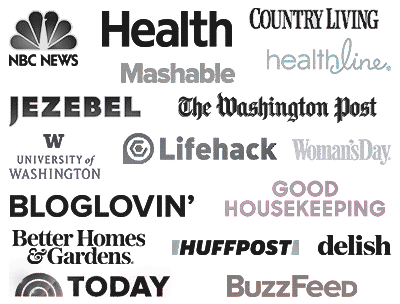 Do you ever have those recipes where you absolutely cannot wait to make and bite into? 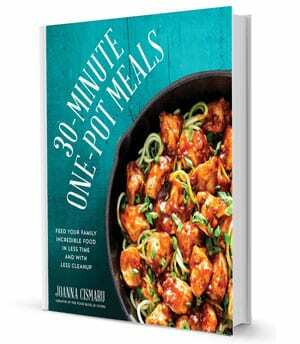 This was it for me, saw this on the cover of Cooking Light magazine and I was hooked. I loved the simplicity of it and of course the ingredients. Summer is almost here so you know I’ll be taking advantage of zucchini and cherry tomatoes. But in my eyes the star of this dish really is the crispy prosciutto. While I still love my pasta in meaty sauces and laden with cheese, I have to say that this dish really did it for me. It’s simply bursting with flavor, the cherry tomatoes and balsamic vinegar absolutely brightens the whole dish up, and the prosciutto really worked here, it gave this dish that extra edge and all you need is a bit of Parmesan cheese, because let’s face it, pasta without cheese is really boring so let’s not even go there. I’m actually putting this dish into the “mind was blown” category, that’s how much I loved it! And all for 430 calories a serving, totally blows my mind. If you wanted to you could use a whole wheat pasta, or a gluten free pasta for the GF version. Remember how I always tell you that hubs and I don’t usually do leftovers, well I couldn’t wait to eat the leftovers here. I actually said no to going to a restaurant for dinner one night, just so I could come home and finish my pasta. Yeah! If you love this pasta recipe, try these! Cook the penne according to package directions and drain. Meanwhile heat 1 tbsp of the olive oil in a large skillet over medium-high heat. Add the prosciutto and cook for about 2 minutes or until crisp. Remove the prosciutto from the skillet and set aside. Add the remaining 1 tbsp of olive oil to the skillet, chopped onion, garlic and red pepper flakes and stir. Cook for about 3 minutes or until the onion is tender. Add the zucchini to the skillet and cook for 2 minutes then add the tomatoes. Season with salt and pepper and cook for 2 more minutes then remove from the heat. 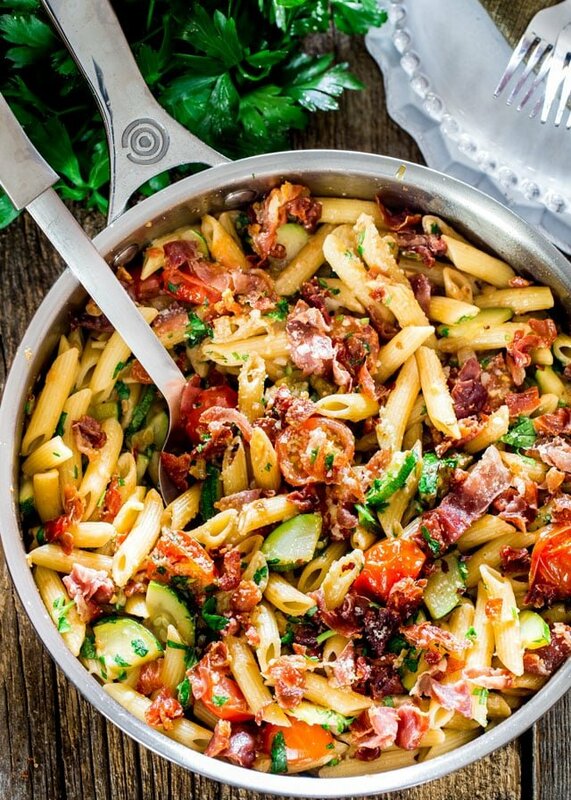 Stir in the penne, balsamic vinegar, prosciutto, half of the Parmesan cheese and the parsley. Divide into 4 bowls and garnish with the leftover Parmesan cheese. This recipe can be made with any type of small pasta. 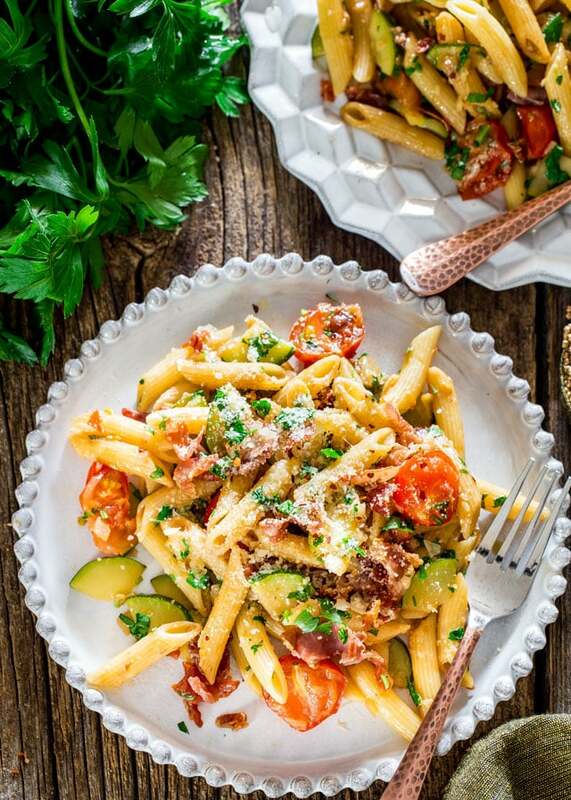 This penne dish is great served both warm or cold. So flavoursome we loved it! For me, I’d reduce the chilli a Lille but that’s personal taste, my other half loved the heat. Definitely make it again! I have made this recipe several times and have served it hot, room temp. and cold. All were wonderful! That’s great, so happy you like it! Delicious. Nice and good taste. Made for dinner last night. Huge hit!! So delish. I doubled recipe and also added fresh mushrooms. Thanks for posting. Wow. This was delish. I made last night. So easy. The flavors are awesome. Perfect for a fast dinner. I used to make a pasta with a CREAMY prosciutto sauce and it MIND BLOWING! I love it when I have leftovers that I cannot wait to eat. Typically they are classic Russian dishes..but every once in awhile…a dish like this makes me drool and pant for the leftovers 🙂 Great recipe!